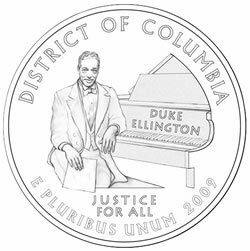 District of Columbia Mayor Adrian Fenty announced Thursday the winning Washington, D.C. quarter design featuring historical jazz legend, Duke Ellington. The Mayor officially communicated the selection to United States Mint Director Edmund Moy. On May 23, D.C. residents were given three quarter design concepts and asked to vote for their favorite. Public voting ended Wednesday, June 18. Over the four week voting period, 6,089 District residents cast online, mail or telephone votes. The voting was close across each, but the winning quarter design of Ellington won by 3 percentage points. In a letter to Director Moy, Mayor Fenty could not help but bring up the Mint’s rejection of D.C.’s first inscription choice, "Taxation Without Representation." "As you know, the overwhelming majority of Washingtonians who participated in the entire process requested that the District quarter include the phrase "Taxation Without Representation" to help educate the country about our historical and continued status as unequal citizens. We were disappointed by your decision to disallow this phrase, as it is a condition with which we live every day." After the Mint’s rejection, the District of Columbia quickly forwarded the motto, "Justice for All." "a 20th Century Washington, DC native and creative genius Duke Ellington), a 19th Century lion of the abolitionist movement (Frederick Douglass), and an 18th Century scientific genius who played and integral role in the physical design of the nation’s capital (Benjamin Banneker)." More information regarding these quarters, to include the design process, may be read though the US Mint page, The District of Columbia and United States Territories Quarter Program. To see or read about all the original design candidates, visit Quarter Image Design Finalists for District of Columbia and United States Territories. I would like to purchase the Duke Ellington quarter but cannot find the information on where to purchase and the cost of the coin. Can you assist? The quarter was pulled because of the “taxation without representation” line. Nevermind, sorry, I was wrong. What is (what appears to be) “jf ccc” on the rear of Washington’s collar (obverse) on the DC quarter? The initials indicate the modified obverse design is by William Cousins (“WC”), who based it from the original John Flanagan (“JF”) design. why are they a gold color?